1-21 'Sweet Britches' – "Opening Chase"
AIRWOLF™ is a Trademark of, and licensed to MCA/Universal City Studios © 1984. By the turn of the Millennium the 'Airwolf Themes: 2CD Special Limited Edition' had become very collectible gaining regular eBay bids (being sold by people who'd reserved and bought more than one copy) in the region of $350-$510 per set. On the 18th March, 2000 the bids culminated in a new record for a television soundtrack when a set sold for $715.03 on eBay. This was subsequently broken on 25th March, 2004 when a Washington-based seller sold his spare 2CD set for $765.03, and then for a third time $981.74 on the 10th March, 2006 remaining the 'Most Expensive Television Soundtrack of all Time'. 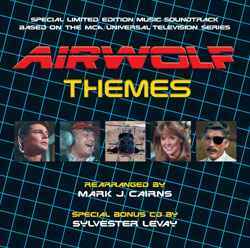 Due to the high prices being paid for the original Airwolf Themes 2CD, several convincing bootlegs have been produced. BEWARE OF EXPENSIVE FAKES!